Energizer®EcoAdvancedTM batteries are another world’s first from the brand that delivers a high performance battery made with recycled batteries – four percent in AA today by weight. By 2025, the vision for Energizer® EcoAdvancedTM brand is to increase the amount of recycled battery material ten-fold to 40 percent. Energizer ‘s award-winning scientists created Energizer® EcoAdvanced TM batteries using exclusive partnerships and breakthrough technology. This technology refines and transforms recycled battery material to create a high-performance active ingredient. This active ingredient, used in conjunction with energy rings, results in a long-lasting battery that has less impact on the planet by requiring less mining of virgin material and reducing the amount of batteries consumers need to power their devices, resulting in less waste. Energizer® EcoAdvancedTM batteries hold up to 12 years in storage. Most of the research and development took place in Energizer’s Westlake, Ohio facility. Energizer invested seven years and more than $20 million to bring Energizer® EcoAdvancedTM batteries to life. In addition, Energizer is working with partners like Redux Recycling in Europe and Retriev Technologies in North America to improve and expand processing capacity, which is the bottleneck today – not battery collection – to achieving our Energizer® EcoAdvancedTM brand vision of increasing the amount of recycled battery material ten-fold to 40%. Consumers told Energizer that they wanted more than just long-lasting batteries. They wanted batteries that were reliable and responsible as well – so Energizer knew they were onto something. 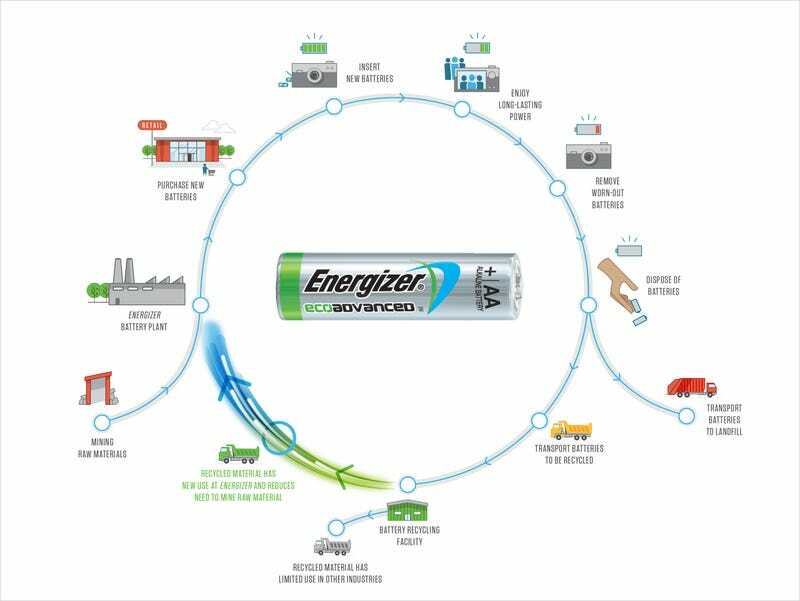 Energizer discovered a way to refine and transform recycled material - true closed loop innovation - to make Energizer’s longest-lasting alkaline battery. The moment of inspiration happened on a visit to a recycling plant, while a team of Energizer scientists stood among piles of material from used batteries that had little economic value. Industry experts said making a battery with recycled battery material couldn’t be done, but Energizer’s scientists wouldn’t take no for an answer. Energizer is taking a portion of old worn-out batteries and turning them into something strong. Energizer® EcoAdvancedTM batteries are our longest-lasting alkaline battery. Learn more here.